That's a massive pain. Fingers crossed he is tempted to stay or a decent fee is received so a suitable replacement can be found. Braces from Uros Matic and Bright Edomwonyi, the pairs first goals of the season, handed Austria Wien a brilliant 4-1 victory over bitter rivals Rapid in the first Wiener Derby of the season. It was a victory that meant Austria continued their winning start to the season, with two wins from two games, with six goals scored and just the one conceded, whilst Rapid were consigned to a second successive Bundesliga defeat of the season as they buckled under the pressure at the Generali Arena. Off the back of the thumping 3-0 win for Austria against Rapid towards the back end of last season, the bragging rights belong well and truly with Die Vielchen fans, as Austria laid out their title credentials early on here. Christopher Steegmann named a strong Die Vielchen line up for a huge game against their eternal rivals, handing a competitive debut to Tomas Hubocan in the heart of his defence with the 33 year old Slovakian, partnering the returning Michael Madl who returned from suspension. The pair played very well together, showcasing a solid understanding as Hubocan’s experience at the highest level of European football showed with the Slovak providing steel and a calm head in the heart of Austria’s backline. Meanwhile Austria’s forward line looked like they were starting to click into gear as Venuto, Grunwald, Prokop and Edomwonyi looked threatening throughout, giving Strebinger little relief over the course of the ninety minutes in the Rapid goal. It was the Serbian Matic who opened the scoring inside five minutes with a powerful and curled effort from just inside the penalty area giving Austria the lead, after Die Vielchen had won the ball back high up the pitch in a perfect example of their pressing game. Edomwonyi had made it 2 just after the half an hour mark with a simple cushioned header from a Lucas Venuto cross as Rapid started to fall apart at the General Arena, before Matic all but sealed the victory for Austria with a thumping effort from outside the penalty area which flew past Strebinger in the Rapid goal to make it three. A fourth goal came just after the hour mark with Austria in charge and dominating the game as Edomwonyi was slipped through and the Nigerian coolly slotted home for his second of the game and the season to ensure it was going to be a memorable night for the home fans. 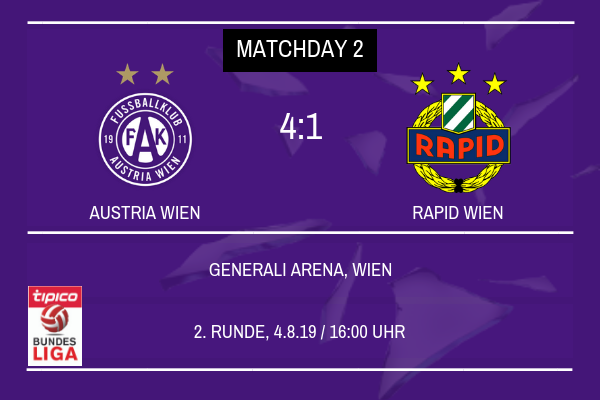 Rapid did pull one back in stoppage time through Lea-Siliki, but it was nothing but a mere consolation for an awful afternoon for Rapid and their travelling fans and it will be Die Vielchen fans who celebrate long into the night after this emphatic victory. It was yet another timely reminder to both Die Vielchen and Rapid fans what this Austria team is capable of under manager Christopher Steegmann and alongside the performance of the team, the noise generated by Die Vielchen fans today showed that if they can continue in this vein of form then Austria Wien will be a real contender for the Bundesliga crown this year. With a trip to Russia coming up on Wednesday though, Austria’s focus will now turn to Champions League duty and preparing for the biggest game of the Steegmann era as Die Vielchen look to end their long wait for Champions League football at the Generali Arena. Justice: Nope it’s not good at all. He did sign a new deal in the summer though and in the Bundesliga you have to offer a player a minimum of three years so he’s got time left on his deal so we could keep him! ScottT: I think if he were to be sold we’d be selling ourselves really short right now with the amount of time left in the window! POW! That is a massive statement of intent, demolishing your rivals early on in the season! Matic seems to be delivering on the faith shown for him, time for the team to kick on and go from strength-to-strength! Massive win against your local rivals! That is gonna give your boys one hell of a boost and the rest of your divisional rivals a fright, fantastic job! 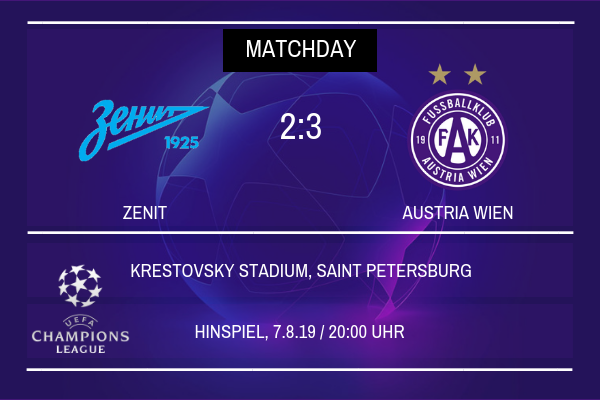 As their bid to qualify for the Group Stages of the UEFA Champions League, Austria Wien travelled to Russia to meet Zenit St. Petersburg in the first leg of their Third Qualifying Round tie. On a cold night in the Russian city, Die Vielchen did themselves and their travelling supporters proud by surprising the Russian giants with a 3-2 victory, giving the visitors a huge chance of progressing to the final round of qualifying, the Play Offs, with the second leg at the Generali Arena still to be played and Christopher Steegmann and his Die Vielchen players will really fancy their chances at home against a team they were expected to be comfortably beaten by here in this first leg. With Zenit manager Sergiy Semak utilising their regular 5-3-2 shape, Die Vielchen were able to find plenty of spaces in the wide areas, but Zenit fans will be disappointed that their side containing players with plenty of Champions League experience in the likes of Vedran Corluka and Claudio Marchisio were unable to pick up a positive result in the home leg of the tie. Meanwhile Christopher Steegmann rotated his side slightly from the team that hammered Rapid Wien 4-1 at the weekend, with Michael Blauensteiner, Jubal, Alexander Borkovic and David Cancola being brought into the team, whilst Blessing Eleke was given his Champions League debut for the club, with the Nigerian making a huge impact on the course of the game. Austria started the game very positively, holding 75% of the possession within the opening 20 minutes, and although Zenit managed to draw some of the ball back from their visitors, Austria took the lead in the 31st minute as Blessing Eleke’s brilliant movement from Alex Grunwald’s corner saw the Nigerian fire a free header past Lunev in the Zenit goal to make it 1-0. Despite their positive, dominant start to the game, Die Vielchen were leaving themselves vulnerable to the counter attack and Zenit had struck level in the 40th minute when Leandro Paredes powered a low driven effort into the bottom corner, however Austria responded immediately as Lucas Venuto squeezed the ball past Lunev in the Zenit goal just a minute later to restore Austria’s lead as the half time whistle came and went. The second half began much like the first half had ended with Die Vielchen pressing for a third goal, however in the 63rd minute, Vedran Corluka had pegged back the visitors once again with a bullet header from Leandro Paredes’ corner after evading his marker to make it 2-2. From this point on the game became a cagey affair with neither side wanting to concede a third goal and throw away the potential of a solid draw heading into the second leg, however when Emmanuel Mammama fouled James Jeggo inside the area in stoppage time the tides turned once again. Bright Edomwonyi, who up until this point hadn’t enjoyed his best performance for Die Vielchen stepped up to calmly slot home from the spot and make it 3-2 and ensure that Austria return to Wien next week with a first leg win and three away goals. The victory against Zenit caps off an incredible week for Die Vielchen after the 4-1 victory over Rapid at the Generali Arena on Sunday and now this first leg win. After a strong start to the campaign, Austria fans will be hoping for more success in the coming weeks and Christopher Steegmann told the fans in his post-match interview to strap themselves in for an enjoyable ride with the German clearly delighted with his teams performance. Up next for Austria is the visit of Rheindorf Altach in the Bundesliga on Sunday, before the return leg against Zenit at the Generali Arena in a weeks time. Justice: BOOM! Matic was really impressive and looks set to be a great addition on a permanent basis! Very impressed with the result, but it is still early, although that is not going to stop us enjoying this! Arguably your best result as manager of Wien, well done man! You have the advantage going into the second leg. Don't concede more than one goal and you're through! Two exceptional results there. The first leg result against Zenit puts you in a fantastic position ahead of the home leg, in which you will be the favourites now. Fingers crossed the pressure won't get to the players and you can see yourselves over the line and through to the next round. 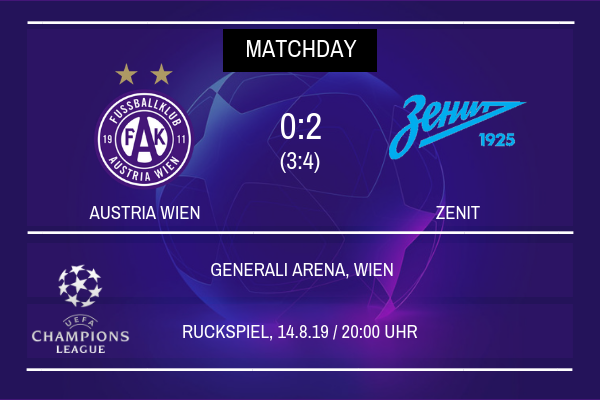 Die Vielchen’s hopes of reaching the Play Offs and the Group Stages of the UEFA Champions League were today ended as Zenit St. Petersburg overcame their 3-2 defeat in the first leg, by beating Austria Wien 2-0 at the Generali Arena. Over the course of the game Die Vielchen will perhaps be disappointed that they were unable to see out their first leg lead and progress from the Third Qualifying Round, but as a result of their defeat here, Die Vielchen will progress into the Group Stages of the Europa League, guaranteeing at least a further six games in UEFA competition. Die Vielchen made a positive start to the home leg of the tie, knowing that a draw would be enough to send them through, but as ever Christopher Steegmann named a strong side, in search of a victory to continue their strong start to the campaign. However, despite having 60% of the possession over the course of the 90 minutes, it was Zenit who proved to be more clinical in front of goal and Christopher Steegmann and his young Die Vielchen side were taught a lesson in Champions League football. Steegmann noted after the game that his side weren’t composed enough in front of goal, stating that next time Champions League football rolled into town they would be better prepared for the challenges and make sure their finishing was up to scratch. As mentioned, Die Vielchen started the game positively, pushing forward for a goal that would put them in complete control of their own fate, but their inability to hit the back of the net would later prove costly. Bright Edomwonyi and Alexander Grunwald, two key figures in front of goal as Austria qualified for the Champions League last season, both had chances that perhaps should have been converted. Zenit were looking dangerous on the counter attack, especially with Sebastian Driussi finding plenty of space, but Patrick Pentz remained strong in Die Vielchen’s goal and kept the scores level as the two sides went into the half time break. The deadlock was finally broken in the 54th minute, with Zenit being sent out by Sergiy Semak in search of the goals that would send through to the Play Offs, with Sebastian Driussi slotting home calmly from inside the penalty area after Michael Madl had allowed the striker to escape his marking. It was a cruel blow for Die Vielchen, but with the scores at 1-0, Austria would still have qualified for the Play Offs by virtue of the away goals rule. However fate had different ideas for Christopher Steegmann and his team, and when Driussi was brought down by James Jeggo in the 78th minute, Claudio Marchisio stepped up to smash a penalty past Patrick Pentz and put the Russians 2-0 ahead and on course for a place in the final round of qualifying for Europe’s premier club competition. Austria pushed forward in the remaining 12 minutes and subsequent stoppage time and will have been disappointed that their efforts in front of goal remained fruitless, but at the end of the day the team will only blame themselves for not taking their chances when given them as their dreams of testing themselves against Europe’s best were ended for another season. It was a defeat that only drags up bad memories of that bad spell of form at the end of last season which saw Austria’s league title bid stutter as Red Bull Salzburg, last season’s eventual Champions were given a place in the Group Stage by virtue of a reshuffle of the places after Manchester United and Arsenal won the two UEFA competitions last year having already qualified for the Champions League. Die Vielchen will now return their attentions back to the Bundesliga and ensuring that if they can put together a title bid this season that it goes the distance. Christopher Steegmann and his side though have qualified for the Group Stages of the Europa League, where they will find out their opponents in one of the twelve groups when the draw is made Friday 30th August. Justice: Yeah it is definitely up there as our best result, the win over Salzburg was great but didn’t end up meaning too much by the time the game was played so this definitely ranks up there! Shame we couldn’t get the result we needed at home! ScottT: Unfortunately it just wasn’t to be man! Europa League here we come! Quite a heartbreaking result but alas, you ran them very close. Europa League football still awaits. I don't understand the stigma surrounding EL football, it is still a luxurious competition to be a part of. It'll be great for Wien to be a part of and play against some of Europe's finest teams. Will also be a great chance to improve the club's European coefficient to potentially give yourselves a better draw next season in Europe, as well as raise income with (hopefully) sellout crowds & additional TV revenue. That's a very upsetting defeat, as you were so close to progressing. At least you have Europa League football to look forward to and European football hasn't entirely disappeared for the remainder of the season. Die Vielchen representatives were in Monaco today as the draw for the Europa League Group Stages were made at the Grimaldi forum. After their elimination from the qualifying stages for the Champions League, Wolfgang Katzien and the other representatives had to wait until the fourth pot of teams were drawn with Die Vielchen’s co-efficient in UEFA competition ranking them amongst the lowest in this year’s competition. However once the draw was made, Die Vielchen were drawn into Group H of the competition with Katzien and the other representatives needing to organise trips to Greece, Switzerland and Belgium. Joining Austria Wien in Group H are Swiss side FC Basel, regulars in the Champions League and a tricky opponent for any of the top sides in Europe, having beaten Chelsea and Manchester United in European meetings in the last decade. 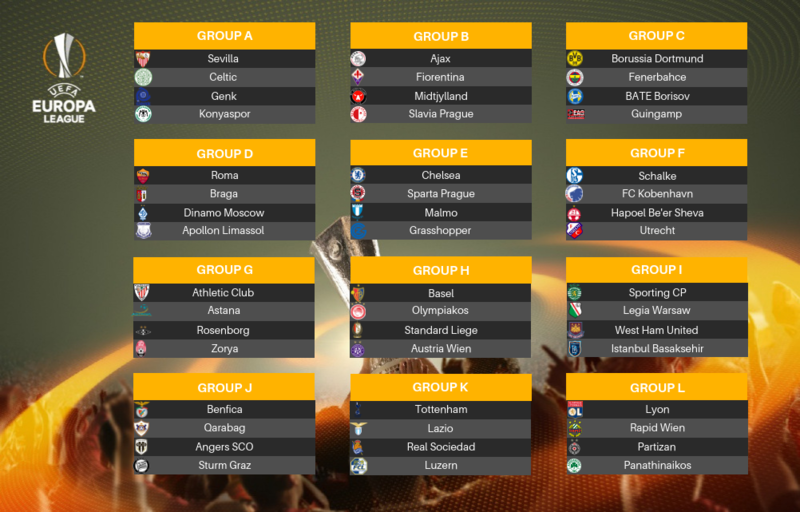 Olympiakos from Greece were drawn from pot 2 whilst Standard Liege were named as the third team in Group H. Whilst the three opponents in Group H will provide six exciting games, Die Vielchen fans will probably be relieved to have avoided some of the giants in the competition with the likes of Sevilla, Chelsea, Borussia Dortmund and Tottenham Hotspur all competing for the famous trophy this season. Austria Wien will begin their Europa League campaign with a tricky trip to Greece, with a meeting against Olympiakos at the Georgios Karaiskakis scheduled on Matchday 1 with the game being played Thursday 19th September. On Matchday 2, FC Basel visit the Generali Arena on October 3rd before Die Vielchen will face back to back games against Standard Liege on Matchdays 3 and 4 with the games being played October 24th and November 7th. Olympiakos will then visit the Generali Arena on November 28th, before Die Vielchen face the difficult visit to St. Jakobs Park to meet Basel on Matchday 6 on December 12th, where Christopher Steegmann and his team will be hoping to secure their qualification for the knockout rounds of the competition and extend their European adventure into the new year. Having failed to qualify for European football in the 2018/19 season, Die Vielchen’s last European campaign was in 2017/18 where they reached the Group Stages of the Europa League, failing to progress from a difficult group which contained the 7 time European Champions AC Milan, AEK Athens and Croatian side Rijeka. This time around Steegmann and the fans will be hoping that they can progress to the Round of 32 for the first time since the 2004/05 UEFA Cup, where they reached the Quarter Finals before being eliminated by Parma. Justice: It was close and maybe we deserved something from it but it just wasn’t to be! I love the Europa League, yeah it throws up fixtures not a lot of people will care about but the latter stages are still really exciting and you rest assured that we’ll be taking it seriously and viewing it as a chance to improve ourselves and test ourselves against decent opposition. Hopefully we can earn a fair amount of cash from it too and we can use that to strengthen the team and the club moving forward! Knocking at that Champions League door ... next year, kick it in! That is a very favourable draw! With the exception of the trip to Greece, which is your first game of the group, you'll only be travelling as far Switzerland or Belgium. While the opponents do have somewhat of a pedigree in European football over the last decade or so, with Basel having played a number of memorable Europa League fixtures, I think you have every chance of topping the group! I think you have a shot to be fair. Some very good sides in the group, but sides that are easily beatable. It's one of those groups that will be very hard to predict, personally.